Some of you already know via Facebook and Twitter that tragedy struck our house this weekend and our precious Finn was taken from us all too soon and without warning. Daniel noticed on Friday evening that Finn wasn't feeling well. He couldn't even be persuaded to eat his kitty crack - rare for a cat who would eat nearly everything, from dried mango to raw green beans. The next morning, he didn't seem any better, so Daniel took him to the vet. The vet noticed he had an enlarged heart and started treating him for that. Daniel called me (I was in Dublin) and said the vet didn't think his prognosis looked good (probably a heart problem like HCM). By afternoon, however, he had stabilized and the vet said she'd like to keep him over the weekend and run tests on Monday. We were upset, but hopeful. As the evening progressed into night, the vet noticed that Finn was taking a turn for the worse. He developed an infection in his stomach and his other organs started to fail. On Sunday morning she called Daniel to tell him that putting him to sleep was the only humane option at that point, and she suspected FIP. And that's how, in 36 hours, Finn went from being a completely active, healthy cat with no symptoms to a victim of a deadly disease. We'll never understand how something so terrible could happen. But enough about his untimely death. The purpose of this post is to celebrate his life. I've heard it said that a measure of an animal's life is not quantity but quality, and we did everything in our power to make his quality of life the best it could be. His whole life was chronicled here every Tuesday. You can relive his public antics via this link. I also wanted to add a few more gems from my huge archive (you can imagine how much I sobbed as I went through them). Finn was born Dain von Dusterwald. 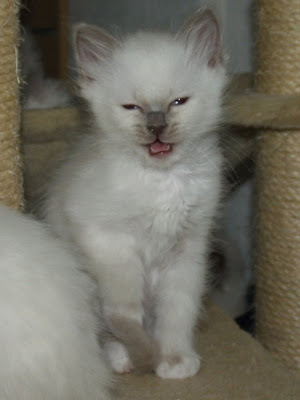 This picture of him at 8 weeks old really shows his spunky personality. One of our favorite stories to tell is one the breeder shared with us. How Finn stole a cookie from her toddler daughter and then defended it with all his might. He was always jumping on our kitchen table too - waiting for an opportunity to run off with our food. Daniel had to guard his morning cereal closely if he didn't want a little tongue lapping up his milk. Both cats liked to be in the same room with us, and since we both work from home, they spent a lot of time hanging out on Daniel's desk. Finny also spent a lot of time grooming his elegant, fluffy "squirrel" tail. Finn loved this chair. It was one of his favorite spots to doze. And he always curled up in such amusing positions. 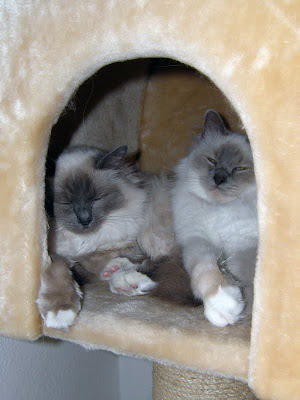 This is our dear Finny hanging with Emmy in their cat palace cubby hole, a very recent photo. Emmy, of course, misses him. While I was going through all my photos, I came across a video of the day we brought him home. In it, he was meowing. And when Emmy heard that, she came running across the room, looking for him. One of Finn's last photo sessions, less than a week ago. 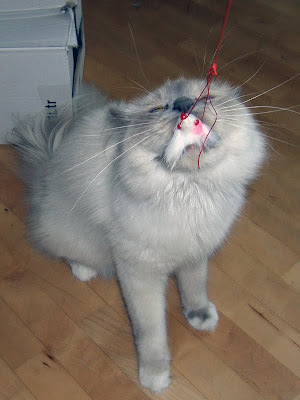 Playing with his "fishing mouse", one of his favorite activities. The house feels emptier here without Finn. Now that he's gone, we realize how much space he took up. He was always the first to greet us when we came in the door. He jumped on our laps whenever they were free. He scratched our bookcase trying to climb up to get at his toys. He kept Emmy balanced. He made us so very happy. He was a light in our lives. He was so loved. I hope you'll understand that my Tuesday tradition of posting cat pictures will go on hiatus for a while. I probably won't be blogging too much in the next 2 weeks either until Dystopian August. Hopefully that will be able to pick up my spirits (the irony!). Poor kitty. I didn't realize just how young he was. :( Again, I'm so sorry this happened Lenore. I've been out of town, so I missed all of this, but I am totally heartbroken for you, Daniel and Emmy. I am so so sorry. I am so sorry to hear about Finn. How is Emmy doing? Oh, Lenore, this brought tears to my eyes. I'm so, so sorry for the loss of your beloved Finn. His life was way too short, but you made it full of love. My thoughts are with you, Daniel and Emmy. I'm so very sorry. Lenore I'm so sorry for your loss and offer my condolences to both you and Daniel. I hope in time you both will heal. Hugs to you both! This made me cry so I can only imagine how you must be feeling. Thanks for sharing a tiny bit of Finn's life with us via the internet so we could know him, too. You don't grieve alone. Beautiful post. I'm sorry for your loss, and wish you all well. I'm so sorry about Finn. I always look forward to his and Emmy's pictures every Tuesday, and it's heart-breaking that this happened. What a beautiful post in homage to Finn - he was a lucky kitty to have "adopted" you. I'm so sorry you were out of town and unable to be with Finn. A *hug* for you and Daniel and a *snuggle* for Emmy. I hope Emmy's tests are good and the FIP hasn't spread (that's a really rotten disease, right up there with FIV :( ). awww hon! I am so sorry to hear that. I am thinking of you guys and hope the great memories of Finn will get you through this rough patch. I'm so sorry to hear about Finn! I loved seeing the photos of him and Emmy. Oh, heiliger Apfelbaum! That's terribly sad to hear. Cute, fluffy Finn... DAMN FIP BEAST! >_< I wish I'd have the right words for you now, but please feel warmly hugged. Oh, I"m so sorry to hear this news - he is such a beautiful little kitty and I enjoy the pictures of him and Emmy that you post every week. Take care. I've thought of you (and Daniel and Emmy) quite a few times ever since I heard on Twitter yesterday. I'm so so sorry for your loss, Lenore. If even I'm sitting here crying just from reading this post, I can't imagine how you all must be feeling. Sending hugs and good thoughts your way. Again, my condolences go out to all of you (that includes Emmy; hope she'll be allright). Hugs to you. Lenore. I am so sorry. Losing a pet is . . . well. I know how it is. Hugs to you all. I'm so so sorry. I had tears running down my cheeks as I read your post. I loved reading your posts about Emmy & Finn's antics. The pictures you posted every week brought a smile to my face. Animals are near and dear to our hearts. I've had dozens in my life, and it hurts so much when they are taken from us. I'm here for you if you need a shoulder to cry on. My sincere sympathy for you, Daniel, & Emmy. I am so, so, so sorry, Lenore. So very sorry. I am so sorry for your loss! I can not tell you how saddened I am by this news! :( You and your family are in my thoughts! This is a beautiful tribute. My condolences and many many virtual hugs to you, Daniel and Emmy. I so looked forward to your Finn & Emmy posts each week, it feels like the whole book blogging community has lost a very dear friend. My thoughts are with you, Daniel, and Emmy right now. I'm so sorry, after my kitty passed last year Finn helped me get through it. Thankfully he had a full and well documented life! Oh, I'm so very sorry to hear about Finn. Cats are more than pets, they are family. Sending you, Daniel, and Emmy lots of good thoughts. Lenore and Daniel: I sat here reading your blog with tears steaming down my face. I know exactly how sad you are and I am so sorry for your loss. I just hope Emmy is okay and she can bring you some happiness and I am sure she is missing Finn also but God must have needed Finn in kitty heaven. You are in my thoughts and prayers. I'm so sorry to hear this. Finn will be missed!! I'm so sorry! I know how it feels to lose a cat suddenly. Last year we went on vacation and our friends who were taking care of our cats found one of them dead. My thoughts are with you. I've had a heavy heart since hearing the news. I'll be keeping you all in my thoughts. Oh, Lenore, I am so sorry to hear this. =/ I can only imagine how hard it must be to lose Finn - I'm so sad just reading this and we've only been able to see Finn's life from afar. I'll be thinking of you, Daniel, and Emmy. I am so SO sorry Lenore. What a horrible tragedy. I am sorry for you and poor Emmy, who I am sure misses her brother. He was such a handsome boy. Finn might've been a biter and a scratcher, but I had fun playing with him while I stayed at your apartment. He was a beautiful, happy kitten. I am sorry for your loss, and I hope Emmy is alright. Oh, that is very sad. It is amazing how every cat has their own very distinct personality, and they do become a real part of the family. We lost our cat, Katy, last fall. It was difficult to explain to our young daughter...she drew a special picture to help deal with the loss and the illustration in your post reminded me of her picture. Sending hugs and purrs your way! So sorry you lost Finn. I loved seeing him in the pictures you always posted. I lost a kitty when she was too young--her kidneys stopped working and they figured it was a birth defect. It is so hard to lose a beloved pet, they really do become part of the family. Take care of Emmy, she must be lonely without Finn around. So sorry. Ah gee, Lenore, I'm so so sorry. I'm so sorry for your loss. I love that he was your baby and a true member of the family. It looks like you guys gave him a super loving home and a very full life and he gave you lots of love in return. I love all the pictures--thanks for sharing them and his story! Oh cats do keep looking for people and other animals after they're gone - breaks your heart. Good luck with the hurting and the healing. I am so sorry to hear about Finn, Lenore. Your weekly photos always made me smile, and we all really loved hearing about both Emmy and Finn. Thank you for sharing him with us. Love the pictures. I know you were lucky to have him while you did, but I think he was lucky to have you and Daniel and Emmy. Wish I could be there in person to cry about it with you! Oh Lenore, this post made me cry. I'm so sorry for your loss. My thoughts are with you, Daniel and Emmy. I'm so sorry that this happened to little Finn. It seems like we were barely helping you choose a name for him. He was a very loved little guy and he will be missed. I'm so sorry, Lenore; reading your updates over the weekend was especially sad, knowing that you couldn't be home with him. All my best to you, Daniel, and Emmy. Lenore, my heart is breaking with yours. I am so sorry - it is so hard to lose a beloved pet. i'm so sorry for your loss, Lenore. i am tears for you and Daniel. i wish i had some comforting words that would take the pain away, but i know there is nothing that can be said.... and though time may dull the pain, i know Finn will always have a special place in your hearts. i can't imagine what you must be feeling. i dread the day that i will have to experience this with my own pet. they become such huge parts of our family... to imagine a world without them is almost unbearable.... i'm sorry that you have to experience it so much sooner than you should have. will be keeping you, Daniel and Emmy in my thoughts..... and hoping that there is a kitty heaven where he can look down on you. Lenore & Daniel & Emmy - I'm sorry to hear that Finn has passed away. His (and Emmy's!) pictures have brought a smile to my face each week - Thank You for sharing his life with us. OMG I am so very sorry for your loss. I know he was the light of your life I can only imagine the pain of losing him. I am so sorry for your loss. I know how you feel because three years ago I had lost my kitty, Blackie. I know you all will get through this. Keeping pictures close by will help some. OMG Lenore! I'm so sorry sweetie! I can remember when you got Finn. My heart really goes out to you, Daniel, and Emmy. Now for the strange part, what happened to Finn is very similar to what happened to my cousin Will who was only 18, almost 19. It started with what seemed like a flu only it was way worse. Took doctors forever to discover he had an enlarged heart and by then his other organs were starting to fail. Will went from being healthy to gone in about three weeks. The worst part about it though was that the doctors basically ignored the fact that his heart was enlarged when they took the first chest x-ray. We were all so shocked and heartbroken so I can imagine what you must be feeling. Once again, I'm so sorry about Finn and may he rest in peace. I'll sure miss seeing him every Tuesday. Lenore, I'm so so sorry. Finn was beautiful. I'm thinking of you & Daniel & Emmy. I'm so sorry to hear about Finn, Lenore. I enjoyed reading the posts about him and Emmy every week. My heart goes out to you. .
Tears are flowing as I read your post my dear sweet niece. We have lost loved pets just like you, so we know the pain and agony that you and Daniel are going through right now. Poor Emmy, I can only imagine how lost she is without Finn right now. Cherish your memories, and also the wonderful pictures that you have of your very special Finn. Losing a loving and loved pet is like losing a member of your family! Love and kisses to you and Daniel! I'm so sad that Finn died. I hope that Emmy is doing ok. My whole family was sad to hear about Finn - my boys really looked forward to seeing the photos of Emmy & Finn each week. He was such a beautiful kitty. ((LENORE)) I am so so sorry. I'm so sorry for your loss. Pets can just be as heartbreaking as the loss of human family sometimes. Your poor kitty! At least he's no longer in pain. I'm sorry, hun. I know losing a pet can hurt bad, especially if it's sudden. I hope you and Daniel are doing okay. And Emmy's coping being by herself. Such a heartbreaking post ... so very sorry for your loss, Lenore. It is never easy to lose a beloved pet, as Finn clearly was. My deepest sympathies to all of you. I'm so terribly sorry to hear about Finn! My heart hurts for you and Daniel right now! I'm so sorry for your loss. Seeing Emma regularly was always a delight but Finn added such an element of fun to the posts. Even watching them meet and get to know each other, you shared so much with us, it feels like we all knew them both. I share your sadness. Take care of each other. I am so so very sorry to hear such sad news. I know from my own experience how hard it is to lose a pet - they become a part of our family. I hope you guys can soon find peace and you spend more time laughing than crying at the memories Finn left you. He was such a lovely cat. I know you'll miss him, and I will miss seeing his photos. Another friend of mine just lost a beloved pet, and I posted a poem about how that can feel--the way you keep thinking you see him out of the corner of your eye, or expecting something he usually did before you're quite awake. Much sympathy. Oh no!! I'm so sorry for your loss... just imagine Finn up in kitty heaven eating all the kitty crack he can get his paws on! (((hugs))) I am so, so sorry! I am so very sorry for your loss. You, Daniel, and Emmy will be in my thoughts during this difficult time. Finn’s personality really came across in the pictures you have posted. I know he’ll be greatly missed. I'm so sorry to hear you've lost your beloved Finn! He's beautiful. Lots of thoughts your way. Oh Lenore :( My heart just breaks for you and Daniel and Emmy. I'm so very very sorry :( Big hugs!! Oh Lenore, I'm so sorry. I have tears streaming down my face after reading your post. I know how it is to lose a cat suddenly like that. It was how I lost my Ethan 4 years ago. He died of a similar problem. I think Finn was one of the most beloved and celebrated cats in the world; and I think he knew it. I'm so sorry for your loss! What a sweet, gorgeous boy he was. The loss of a pet is never easy, and I have lost many, but their life and love will never be forgotten. Finn was just as lucky to have you as you were to have him. I am so sorry to hear about Finn, that is devastating news. My thoughts are with you, Daniel and Emmy. Oh no. I'm so sorry. Take as much time as you need off. 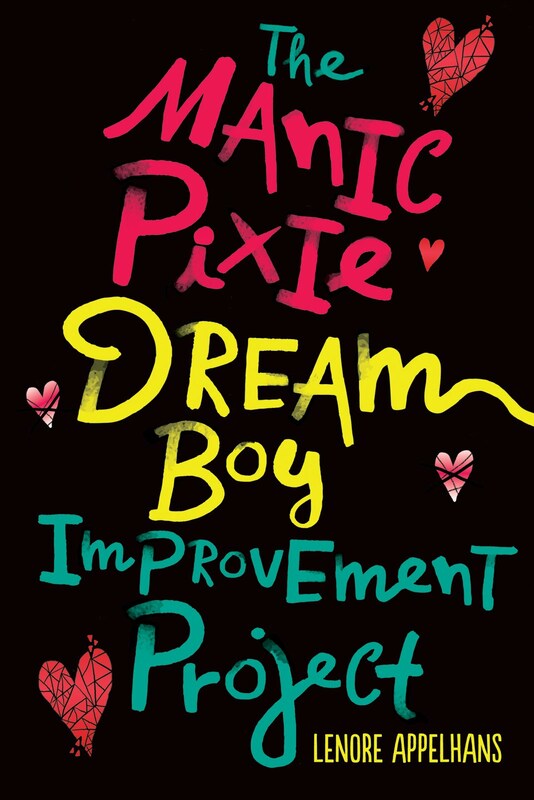 Finn will definitely be missed by your readers too. Such an adorably sweet cat. Oh, I am just destroyed. I've lost cats suddenly and will cry for months (years) after. Poor Finny Baby Kitty. Watch out for Emmy - she will grieve too. I am just so so sorry. OMG, that is just so sudden and unexpected. I'm sorry to hear that he is gone. I loved watching his antics with Emmy. He seemed so full of life...and I think that's how you should remember him. He was a light that burned brightly. Oh, Lenore. I am so, so sorry for your loss. Pets are more than just domesticated animals. They are family. They are often the only ones who 'get it'. They offer unspoken support when the going gets tough. I think Finn brought joy to a lot of people who never even met him, I know I always enjoyed your weekly picture of Finn and Emmy. I'm so sorry Lenore. And I would be a wreck after hearing Gold Dust performed in your situation (I think I'd be extremely touched by her played it in whatever situation). Oh Lenore, I am so sorry to hear about Finn. I cried reading your post and know just what you are feeling, as I lost a beloved cat unexpectedly not that long ago. Please take care of yourselves and Emmy, and know that you gave Finn a very happy life. So sorry to hear about Finn, Lenore! My thoughts are with you. I'm so sorry...I lost a cat last year suddenly too and know how painful it is. But know that they are always with you. I'm so sad to read this! I loved seeing the pictures of Emmy and Finn. You, Daniel and Emmy are in my thoughts. So sorry about this. Our fur babies are such a part of the family. Hugs for all of you. I'm so sorry to hear about Finn. He was so young! I hope Emmy is not too confused and bereft, it must be confusing for a pet to loose their companion- you can't explain it to them what happened. Hugs to all of you. *hug* I am so, so sorry about this. I do not comment here often, but I read your blog regularly and I always loved seeing pictures of your gorgeous cats. I hope you are taking care of yourself--losing a pet is awful. Lenore, I'm so sorry for you and Daniel's loss. How horribly unfair. I'm so sorry, Lenore. *hugs* My 7 month old kitten died of FIP, and it was also quite sudden. Are you planning on finding Emmy playmate, or are you going to wait awhile? Oh, Lenore, I am so sorry for your loss. Poor Fin. It's so hard to lose a loved one. I'm sure the blog record of his happy life is a comfort. I'm so sorry. I shed a tear for Finn - and for you. Sending positive thoughts your way. I am shocked and saddened to hear this news. I always looked forward to seeing your beautiful kitties. So sorry this happened. Let's all give our pets an extra hug today. So sorry for your loss. We know how pets can become family members and what a hole they leave when they're gone. I'm so sorry to hear about this. *hugs* This post made me tear up. :( RIP Finn. I am so sorry to hear about your loss. My thoughts are with you, Daniel, and Emmy. May Finn rest in peace. I hope you are doing ok after this but I know it's tough going. Oh Lenore...I am so so so sorry. I always looked forward to his and Emmy's pictures every week (I love the one in his wine box a couple weeks ago!) My heart aches for you, Daniel, and Emmy. This was a totally beautiful post, that made me cry like a baby. Finn was a very lucky kitty to have a family like you guys, and even all of us that just got to know him through our weekly updates. I lost one of my dogs earlier this year and it's hard. But sweetie, you take as long as you need and we'll be here when you're ready to come back. My heart and prayers for out to you, Daniel, and Emmy. I am so sorry, Lenore. I found myself tearing up while reading this post so I can only imagine how you feel. Pets are such a joy and losing them is always heartbreaking. I hope the fact that you have the thoughts of at least 109 people with you can help you get through this. My heart goes out to you. I am happy that you were able to bring so much love into his life and he was able to bring so much into yours. My condolences to you. I'm so sorry to hear about Finn. I know its like losing a part of your family. My condolences to you and Daniel. I know Finn will always be remembered. What a beautiful post to a very beautiful friend-I am very sorry to hear of this. Lenore, I am so sorry for your loss. Pets are a huge part of our family, so I understand the pain and loss you must be feeling. I loved your pictures! I'm sure he is frolicking about at the Rainbow Bridge, no longer in any pain. Sending lots of cyberhugs your way. So sorry for your loss. I know you will always remember Finn with fond memories. I know Emmy will miss him and she will need more attention now. My silver grey persian is 12 yrs old and today she has been acting strange. I called vet but they had already closed and will see her in the morning. She is pacing back and forth, refusing to eat or drink which is not like her. She also will let me hold her and pet her which she has seldom done. I will be worried all night but can't get in touch with another vet tonight. I am so sorry to hear that. He is a wonderful cat. He looks so cute in the entire picture. I wish I can do anything to help you move on. I ams so sorry for the loss of Finn. I love that you share your pets with us and I feel as though I know them. Sending warm fuzzies and hugs your way!! I am so sorry to hear about the loss of your beloved Finn. I have been out of town and am still catching up on my Google Reader stuff. Even though I didn't comment on them often, I loved the pictures of Finn and Emmy. They always brought a smile to my face. I know that your little kitty was very special to all of you and my thoughts are with you right now. Oh...I am so terribly sorry to hear this...I was sick this weekend and was just catching up and went looking for your normal Tuesday pics and found out....so sad. 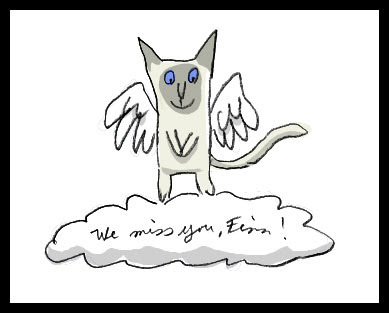 But I love the sketch of Finn as a wee kitty angel. *sniffle* I'm so sorry to hear this. I started reading your blog just before you got Finn, and I remember thinking how much Finn reminded me of my own cat, Tessa, in looks. It was always fun to see the pictures because it was like someone was taking pictures of Tessa's fluffier twin.